Wednesday August 24 1910 Vera and I went to the fair in the afternoon We met the Woolfs there. Mary was with them It looked like rain but it [illegible] to the north. The dirt here is a [illegible] as there has been no rain Thursday August 25 1910 It was much cooler today. Vera and I went to the fair in the afternoon. It was late supper time when we got home. Met among friends and had a good time. Too cool to sit on the porch tonight. 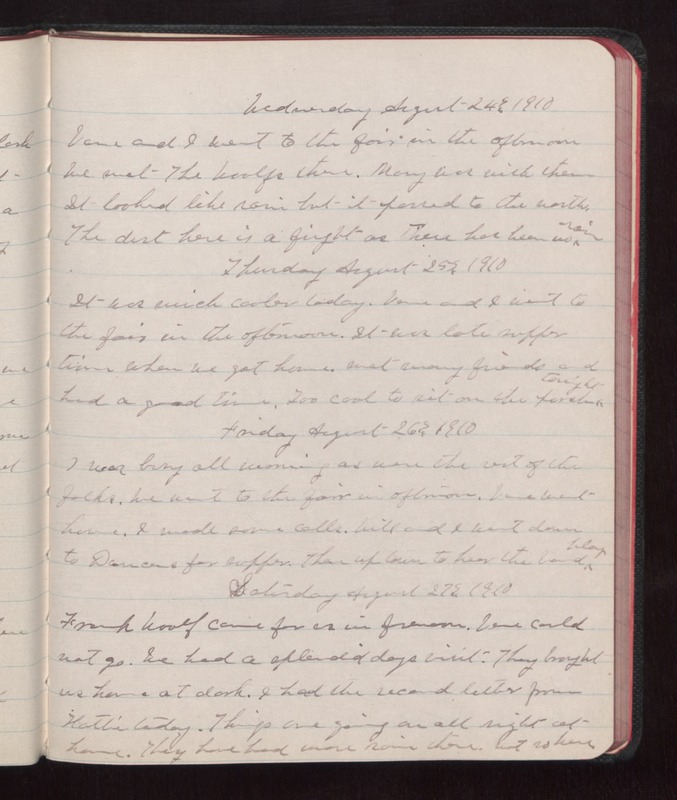 Friday August 26, 1910 I was busy all morning as were the rest of the folks. I made some calls. Will and I went down to Duncans for supper. Then up town to hear the band play Saturday August 27 1910 Frank Woolf came for us in the forenoon. Vera could not go. We had a splendid days visit. They brought us home at dark. I had the second letter from Hattie today. Things are going on all right at home. They have had more rain there. not so here.